This article is about Volvo Cars. For the separate Swedish-owned manufacturer of trucks, buses and construction equipment (among others) otherwise known as the Volvo Group (AB Volvo), see Volvo. For other uses of "Volvo", see Volvo (disambiguation). Volvo Cars (Swedish: Volvo personvagnar), stylized as VOLVO, is a Swedish luxury vehicles company. It is headquartered on Torslanda in Gothenburg, and is a subsidiary of the Chinese automotive company Geely. The company manufactures and markets sport utility vehicles (SUVs), station wagons, sedans and compact executive sedans. The Volvo Group was founded in 1927 as a subsidiary of the ball bearing manufacturer SKF. When AB Volvo (now a separate company) was introduced on the Stockholm stock exchange in 1935, SKF sold most of its shares in the company. Its cars are marketed as being safe, solidly built, and reliable. The heavy truck and construction equipment conglomerate AB Volvo and Volvo Cars have been independent companies since AB Volvo sold Volvo Cars to the Ford Motor Company in 1999. Volvo Cars has been majority-owned since 2010 by the Geely Holding Group. Both AB Volvo and Volvo Cars share the Volvo logo, and cooperate in running the Volvo Museum. With approximately 2,300 local dealers from around 100 national sales companies worldwide, Volvo Cars' largest markets are China, the United States, Sweden and other countries in the European Union. Most of its worldwide employees are based in Sweden. Recently, Volvo paid $17.4 million in fines for missing its Corporate Average Fuel Economy targets for the 2010-14 model years. In July 2017, Volvo announced that new models launched from 2019 onward would be fully electric or hybrid-electric, heralding the end of production of nearly a century of Volvo vehicles powered solely by the internal combustion engine. Volvo, however, will continue to produce non-electric, non-hybrid cars from models introduced before that year. Volvo was founded upon the concept of safety in 1927 in Gothenburg, Sweden. The company was created as a subsidiary company 100% owned by SKF (Swedish: Svenska Kullagerfabriken). Assar Gabrielsson was appointed the managing director (CEO) and Gustav Larson as the technical manager. 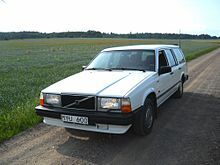 The trademark Volvo (which is Latin for 'I roll') was first registered by SKF on 11 May 1915 with the intention to use it for a special series of ball bearing for the American market but it was never used for this purpose (however in the application for the trademark, it was also designated for the purpose of automobiles). The SKF trademark as it looks today was used instead for all the SKF-products. Some pre-series of Volvo-bearings stamped with the brand name 'Volvo' were manufactured but never released to the market, and it was not until 1927 that the trademark was used again, now as a trademark and company name for an automobile. In the early 1970s, Volvo acquired the passenger car division of the Dutch company DAF, and marketed their small cars as Volvos before releasing the Dutch-built Volvo 340, which went on to be one of the biggest-selling cars in the UK market in the 1980s. 1986 marked a record year for Volvo in the US, with 113,267 cars sold. The appearance of Japanese brands like Acura and Lexus and the growing popularity of Subaru station wagons in subsequent years meant the loss of a significant market share for Volvo, one which they have never regained. The Volvo C30 is one example of a Volvo produced under Ford ownership. Volvo Car Corporation was part of Ford Motor Company's Premier Automotive Group (PAG), along with Jaguar, Aston Martin and Land Rover. While part of the PAG, the company significantly expanded its range of vehicles. After Ford sold Jaguar Land Rover to Tata Motors of India in 2008, the company initially decided to keep Volvo Cars despite mounting losses and major economic downturns. Ford decided to restructure plans for Volvo Cars, pushing it further upmarket, alongside the lower end of Mercedes and BMW sedans, wagons, and SUV crossovers. The outcome was the luxurious second generation Volvo S80 and the new small premium crossover Volvo XC60. When the global economic crisis of 2008 threatened the US automakers, Swedish authorities became concerned about the fate of Volvo, should Ford file for bankruptcy. These concerns mounted after repeated mass-layoffs at Volvo. In December 2008, Ford announced that it was considering selling Volvo Cars. Initially, a sale price of US$6 billion was reported. Ford said it was also looking into the possibility of spinning off Volvo as an independent company. The Swedish government was asked to look into a possible state ownership of Volvo, or a financial bailout for Volvo Cars and SAAB of GM. Former parent AB Volvo agreed to help Volvo cut costs through partnerships, and suggested taking part in a shared ownership of Volvo Cars, as part of a larger consortium. Other rumored candidates to purchase Volvo Cars included BMW AG of Germany, Investor AB of Sweden, Chinese investors, and Russian investors. Stefan Jacoby, formerly chief executive of Volkswagen of America, became Volvo Car Corporation's president and chief executive on 16 August 2010, replacing Stephen Odell, who became chief executive of Ford Europe. Li Shufu became Volvo Cars' chairman of the board. His board members include vice-chairman Hans-Olov Olsson, a former president and chief executive of Volvo Cars, and Håkan Samuelsson, formerly chief executive of MAN. As of 2016, 61.4% of its 31,416 worldwide employees were still in Sweden. Under Geely ownership, Volvo has refocused its product lineup. The manufacturer has developed a new line of 3- and 4-cylinder diesel and petrol engines while eliminating larger engines. It has also developed a new vehicle platform, the Scalable Product Architecture (SPA), and re-introduced an expanded -90 series of models, including the S90 sedan and Volvo V90 wagon in addition to a redesigned XC90 SUV. In 2015, Volvo sold more than half a million cars for the first time in its 89-year history. Volvo reported strong sales from all three core global regions. Sales in Europe rose 10% in 2015 to 269k, representing over 50% of total global volume. Volvo’s revival in the US gained momentum, with sales up 24% in 2015, while China was flat amid a challenging sales environment, but sales were up 11% in the fourth quarter. In July 2017, the automaker announced that beginning in 2019, all of its new models will include an electric motor in their powertrain. Implementation of the announcement could mean Volvo becoming the first manufacturer to end production of internal combustion-only vehicles, with all vehicles hybrid or electric powered. Between 2019 and 2021, Volvo plans to launch 3 electric cars under the Volvo brand and 2 more under the Polestar performance brand. Volvo was also a proponent of autonomous vehicles. On 20 November 2017, Uber announced that it planned to buy up to 24,000 Volvo cars designed to accept autonomous technology between 2019 and 2021. This non-binding intent includes a plan for Uber Advanced Technologies Group to design and build the self-driving system in the XC90 SUV vehicles. In 2016, the two companies had announced that they planned to collaborate on the design and financing of cars with self-driving systems. Such vehicles require a different type of steering and braking mechanism, as well as sensors. The CEO of Volvo Cars, Håkan Samuelsson, made this comment in an interview: "We get support developing this car ... It’s also a big commercial deal." Also in 2017, Volvo announced a vehicle subscription offering called Care by Volvo, which offers the Volvo XC40 for a monthly payment that includes insurance and maintenance. Care by Volvo is offered in several European markets, such as Germany, the UK and Italy, as well as in the U.S. In 1998, Volvo installed a head-protecting airbag, which was made standard in all new models as well as some existing models. The IC head-protecting airbag was not available on the 1997 C70 since the initial design deployed the airbag from the roof, and the C70, being a convertible, could not accommodate such an airbag. A later version of the C70 featured a head-protecting airbag deploying upwards from the door, avoiding this problem. It has been stated by many testing authorities that side head protecting curtain airbags can reduce the risk of death in a side impact by up to 40% and brain injury by up to 55%, as well as protect occupants during a rollover. In 1998, Volvo introduced its Whiplash Protection System (WHIPS), a safety device to prevent injury to front seat users during collisions. Even though Volvo Car Corporation was owned by Ford Motor Company, Volvo's safety systems were still standard on all Volvo vehicles. Volvo has patented all its safety innovations, including SIPS, WHIPS, ROPS, DSTC, and body structures. Some of these systems were fitted to other Ford vehicles in forms similar to those of Volvo systems, but only because Volvo licensed the FOMOCO and other PAG members to use these features. Volvo has also scored high in EuroNCAP tests. Since 2009, all the Volvo models that EuroNCAP have tested have received five-star safety ratings: Volvo C30, V40, V60, V60 plug-in hybrid, XC60 and V70. The second generation Volvo V40 got the best test result of any car model ever tested by EuroNCAP at the time. The Amazon was noted for its safety features: a padded dashboard, front and rear seat belts, and a laminated windshield. 2018 – Head-on crash detection with Auto Brake. In 2017, Volvo achieved record sales for the fourth year in a row, with 571,000 cars sold. European sales figures are from the following countries: Austria, Belgium, Cyprus, Czech Republic, Denmark, Estonia, Finland, France, Germany, Great Britain, Greece, Hungary, Iceland, Ireland, Italy, Latvia, Lithuania, Luxembourg, Netherlands, Norway, Poland, Portugal, Romania, Slovakia, Slovenia, Spain, Sweden, Switzerland. The Volvo 740 was one of the few European passenger cars that can carry a EUR-pallet in its luggage compartment. Today, the company uses a system of letters denoting body style followed by the series number. "S" stands for "sedan", "C" stands for "coupé" or "convertible" (including three-door hatchback AKA "shooting brake") and "V" stands for "versatile" (5-door hatchback and station wagon). "XC" stands for "cross country" originally added to a more rugged V70 model as the V70XC and indicates all wheel drive paired with a raised suspension to give it an SUV look. Volvo would later change the name to the "XC70" in keeping with its car naming consistent with the XC90. So a V50 is an estate ("V") that is smaller than the V70. 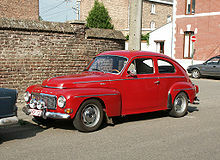 Volvo has, since the 1950s, had special international sales programs for customers assigned abroad, for example Diplomat Sales, Military Sales and Expat Sales. In 1990, Volvo Cars filed a lawsuit against Hong Kong-based Club Volvo night club for infringement in Hong Kong High Court. The lawsuit ended with settlement where the night club paid 1 dollar to Volvo Cars. Since then, Club Volvo had been renamed to Club Borubo (the Japanese pronunciation of "Volvo"), and then Club Bboss (reference to Big Boss). ^ "Volvo Cars reports record sales in 2017". www.media.volvocars.com. Volvo Car Corporation. 4 January 2018. Retrieved 2018-02-03. ^ a b c d e "Volvo Car Group Annual Report 2017" (PDF). investors.volvocars.com. Volvo Car Group. 2018. Retrieved 2018-06-14. ^ a b Volvo Car Corporation. "Company - Volvo Car Group". www.volvocars.com. Retrieved 2017-11-22. ^ "CAFE PIC Civil Penalties". one.nhtsa.gov. US Department of Transportation. Retrieved 2019-01-06. ^ "Geely's Volvo to go all electric with new models from 2019". CNBC. Reuters. 5 July 2017. Archived from the original on 2018-01-06. Retrieved 2017-07-15. ^ Jim Motavalli (29 March 2010). "Volvo Goes to China: Will Its Tradition of Safety Go With It?". www.cbsnews.com. CBS News. Archived from the original on 2015-10-18. Retrieved 2018-01-09. ^ Volvo Car Corporation (11 May 2007). "Children should travel rearward facing until they are three-four years". media.volvocars.com. Archived from the original on 2017-12-09. Retrieved 2017-07-13. ^ a b "Volvo Urged, 'Drive It Like You Hate It'; Scoffers Did and They Liked It". Automotive News; 100 Year Almanac. Crain Communications: 80. 24 April 1996. ^ a b Björn-Eric Lindh (1986). Volvo: The Cars - From the 20s to the 80s (2nd English ed.). Malmö, Sweden: Förlagshuset Norden. p. 138. ISBN 91-86442-14-7. ^ Volvo Car Corporation (2 April 2014). "Volvo Car Torslanda celebrates 50 years of success". www.media.volvocars.com. Archived from the original on 2017-06-30. Retrieved 2015-02-25. ^ "Volvo Adventures, Volvo assembly plants". volvoadventures.com. Retrieved 2018-01-06. ^ Zach Bowman (4 October 2011). "Volvo to end C70 production in Uddevalla, will it surface elsewhere?". www.autoblog.com. Oath Inc. Archived from the original on 2017-08-04. Retrieved 2018-01-06. ^ "Andra chansen till norsk olja" [Second chance at Norwegian oil]. Affärsvärlden (in Swedish). Stockholm, Sweden: Talentum Media AB. 7 February 2012. Archived from the original on 2017-11-08. Retrieved 2018-01-06. ^ a b "Volvo brand celebrates its 90th anniversary". DesignTAXI.com. 29 May 2005. Archived from the original on 2016-03-04. Retrieved 2017-07-13. ^ "Volvo enters into agreement with Ford to sell Volvo Cars for SEK 50 billion". Cision Wire. 28 January 1999. Archived from the original on 2012-03-28. Retrieved 2016-02-01. ^ Nedcar Corporation (1 May 2006). "History: Once upon a time..." www.nedcar.nl. Archived from the original on 2007-07-29. Retrieved 2017-07-13. ^ Harley Michael (4 December 2008). "Ford wants US$6 billion for Volvo". Autoblog. Archived from the original on 2017-07-11. Retrieved 2010-11-23. ^ Korzeniewski, Jeremy (2009-02-05). "REPORT: Geely denies plans to buy Volvo". Autoblog.com. Retrieved 2010-11-23. ^ "Geely confirms interest in Volvo". www.motorauthority.com. Archived from the original on 1 September 2009. ^ "Geely jumps to nine-year high after Goldman Bond sale (Update2)". Bloomberg. Retrieved 2010-11-23. ^ "Goldman investment boosts China Geely's global hopes". London: Guardian. 7 May 2008. Retrieved 2010-11-23. ^ Ford Motor Corporation. "Re-Evaluate Strategic Options for Volvo Car Corporation". www.ford.com. Archived from the original on 2009-07-08. Retrieved 2010-11-23. ^ Andrew Clark (28 October 2009). "Ford set to offload Volvo to Chinese carmaker Zhejiang Geely". London: Guardian. Retrieved 2009-12-04. ^ "Geely/Volvo deal 'done by Feb'". Autocar. 17 December 2009. Retrieved 2009-12-22. ^ Matthew Dolan (16 July 2010). "Volvo Deal Sparks Leadership Shake-Up". Wall Street Journal. Retrieved 2010-08-07. ^ Ford Motor Company. "Ford reaches agreement to sell Volvo Cars and related assets to Geely". www.ford.com. Archived from the original on 2010-03-31. Retrieved 2010-03-30. ^ Ola Kinnander and Keith Naughton (2 August 2010). "Geely Seals Takeover of Volvo From Ford; Jacoby Named CEO". Bloomberg. Retrieved 2010-08-21. ^ "Zhejiang Geely Completes Acquisition of Volvo Car Corporation. Stefan Jacoby Named President and CEO of Volvo Cars". volvocars.com. 2010-08-02. Retrieved 2010-08-07. ^ Callaway, Sue. "2016 Volvo XC90: Swedish safety has never looked—or felt—so good". fortune.com. Retrieved 2017-07-06. ^ Volvo Car Corporation (8 January 2016). "Volvo Cars reports record sales of 503,127 in 2015". www.media.volvocars.com. Retrieved 2017-07-14. ^ Chris Stewart (5 July 2017). "Volvo Cars to go all electric". www.swedespeed.com. Retrieved 2017-07-05. ^ Samuel Gibbs (20 November 2017). "Uber plans to buy 24,000 autonomous Volvo SUVs in self-driving push". Retrieved 22 November 2017 – via www.TheGuardian.com. ^ "Volvo Cars to supply Uber with up to 24,000 self-driving cars". 20 November 2017. Retrieved 2017-11-22 – via Reuters. ^ a b "Volvo in 'killer brakes' inquiry". London: The Independent. Retrieved 2010-11-23. ^ "The 50-year-old Innovation". Edmunds.com. Retrieved 2010-11-23. ^ "Volvo Cars Safety". Volvocars.com. 8 September 2009. Archived from the original on 6 August 2010. Retrieved 2010-11-23. ^ a b c Volvo Car Corporation (1998). "Second-Generation Sips-Bag protects both chest and head". www.volvogroup.com. Archived from the original on 30 June 2015. Retrieved 14 July 2015. ^ CarAccidentAttorneyHawaii.com. "Safety Recalls". Safety Recalls. Retrieved 2011-03-16. ^ "1998". Archived from the original on 14 July 2015. Retrieved 14 July 2015. ^ "Haldex Traction Systems – About Us". www.haldex-traction.com. Archived from the original on 2007-09-28. Retrieved 2010-11-23. ^ "2006 Volvo C70". Retrieved 14 July 2015. ^ "Volvo Develops Inflatable Curtain (IC) for Cabriolets". Retrieved 14 July 2015. ^ "Patent US7690682 - Folding method for door mounted inflatable curtain". Retrieved 14 July 2015. ^ "English (Reports) – Folksam" (in Swedish). Folksam.se. Archived from the original on 2007-11-09. Retrieved 2010-11-23. ^ "2006 Safety Picks". SecurityWorld.com. Archived from the original on 2007-05-29. Retrieved 2009-05-28. ^ a b "Insurance Institute: Ten safest cars". CNN. 5 December 2005. Retrieved 3 November 2014. ^ a b Volvo Car Corporation (21 June 2007). "Volvo Cars' unique Personal Car Communicator (PCC) has won the Innovation award at the 2007". www.media.volvocars.com. Retrieved 2016-06-16. ^ Volvo Car Corporation. "Personal Car Communicator". Retrieved 2018-01-08. ^ "High-tech for Volvo S80, V70, XC70". CNET. CBS Interactive. Retrieved 14 July 2015. ^ Ossi Carp och TT (31 January 2008). "DN: Volvo vållade barns död". ww.dn.se (in Swedish). Archived from the original on 2011-06-11. Retrieved 2010-11-23. ^ "The Local: Volvo fined over children's death". www.thelocal.se. The local. 17 June 1999. Retrieved 2010-11-23. ^ "IIHS-HLDI: Volvo S40". Iihs.org. Archived from the original on 2009-06-02. Retrieved 2009-05-28. ^ "IIHS-HLDI: Volvo S60". Iihs.org. Archived from the original on 2009-10-04. Retrieved 2009-05-28. ^ "IIHS-HLDI: Volvo 850/S70". Iihs.org. Archived from the original on 2008-11-28. Retrieved 2010-11-23. ^ "IIHS-HLDI: Volvo XC90". Iihs.org. Archived from the original on 2010-09-20. Retrieved 2010-11-23. ^ "IIHS-HLDI: Volvo S80". Iihs.org. Archived from the original on 2010-11-20. Retrieved 2010-11-23. ^ "IIHS-HLDI: Volvo C70". Iihs.org. Archived from the original on 2013-07-18. Retrieved 2013-04-14. ^ "IIHS-HLDI: Volvo XC60". Iihs.org. Archived from the original on 2010-11-20. Retrieved 2013-04-14. ^ "IIHS-HLDI: Volvo S60". Iihs.org. Archived from the original on 2009-10-04. Retrieved 2013-04-14. ^ "IIHS-HLDI: Volvo C30". Iihs.org. Archived from the original on 2013-05-02. Retrieved 2013-04-14. ^ "volvo-xc90-earns-institutes-top-safety-award". Iihs.org. Retrieved 2014-12-17. ^ "Volvo S80". Iihs.org. Retrieved 2014-12-17. ^ "Volvo - Euro NCAP - For safer cars crash test safety rating". Retrieved 2013-04-14. ^ "Record-breaking safety rating for the all-new Volvo V40 in Euro NCAP test". media.volvocars.com. Volvo Car Corporation. Archived from the original on 2017-06-30. Retrieved 2013-04-14. ^ "Retrospective: Volvo History (Channel 4)". Archived from the original on 2007-10-17. ^ "Fourth consecutive year of record sales for Volvo". www.thelocal.se. The Local. 4 January 2018. Archived from the original on 2018-01-08. Retrieved 2018-01-08. ^ Helena Soderpalm (4 January 2018). "Volvo Cars sales rise to fresh record in 2017 despite December dip". Edited by Niklas Pollard. Reuters. Archived from the original on 2018-01-08. Retrieved 2018-01-08. ^ "Volvo S90 and V90 European sales figures". carsalesbase.com. Retrieved 2018-03-24. ^ www.ETAuto.com. "Volvo Auto India posts 10% growth in 2016; plans to sell 2000 units in 2017 - ET Auto". ETAuto.com. Retrieved 2018-01-05. ^ "Volvo XC90 European sales figures". carsalesbase.com. Retrieved 2018-03-24. ^ "Volvo XC60 Sales Figures -". GCBC. 2011-01-03. Retrieved 2018-03-28. ^ "Volvo XC60 US car sales figures". carsalesbase.com. Retrieved 2018-03-24. ^ "Volvo XC40 European sales figures". carsalesbase.com. Retrieved 2018-03-24. ^ a b "Volvo S90 Sales Figures -". GCBC. 2015-10-31. Retrieved 2018-01-02. ^ "Volvo S90 China auto sales figures". carsalesbase.com. Retrieved 2018-01-02. ^ a b "Volvo S90 and V90 European sales figures". carsalesbase.com. Retrieved 2018-01-02. ^ "Volvo S90 Sales Figures -". GCBC. 2015-10-31. Retrieved 2018-01-21. ^ a b "Volvo XC90 Sales Figures -". GCBC. 2011-01-03. Retrieved 2018-01-02. ^ a b c "Volvo XC90 European sales figures". carsalesbase.com. Retrieved 2018-01-05. ^ "Volvo XC60 Sales Figures -". GCBC. 2011-01-03. Retrieved 2018-01-02. ^ a b "Volvo S60 Sales Figures -". GCBC. 2011-01-03. Retrieved 2018-01-02. ^ a b c "Volvo S60L China auto sales figures". carsalesbase.com. Retrieved 2018-01-02. ^ a b "Volvo XC60 China auto sales figures". carsalesbase.com. Retrieved 2018-01-02. ^ "Volvo European sales figures". ^ Volvo Car Corporation (27 June 2013). "Heritage - Volvo S40 (1995-2012)". www.media.volvocars.com. Archived from the original on 2017-06-30. Retrieved 2016-06-16. ^ a b c Volvo Car Corporation (3 July 2003). "Volvo's estate cars – a high-capacity trip down memory lane". media.volvocars.com. Archived from the original on 2017-06-30. Retrieved 2016-06-16. ^ a b c Volvo Car Corporation (8 January 2000). "1990-1999: A historical review". media.volvocars.com. Archived from the original on 2017-06-30. Retrieved 2016-06-16. ^ John Tylee (10 November 1995). "Abbott Mead wins Euro Volvo launch". www.campaignlive.co.uk. Retrieved 2017-07-14. ^ Diana T. Kurylko (4 September 1995). "Shakeup at Volvo". Crain Communications. Retrieved 2017-07-14. ^ Volvo Car UK Limited (October 1995). "Stylish S4 spearheads Volvo's compact class challenge" (PDF). www.volvoclub.org.uk. pp. 3, 12. Retrieved 2017-07-14. ^ Volvo Cars Press Release (8 November 2006). "Volvo Expands Range of FlexiFuel Cars". World Car Fans. Retrieved 2008-08-24. 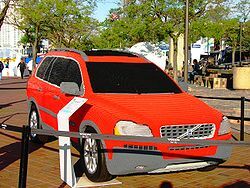 ^ Volvo Car Corporation (2008). "About Volvo Corporation 2007 and 2008". Volvo Cars. Archived from the original on 2008-06-29. Retrieved 2008-08-24. ^ "Volvo ReCharge Concept Debuts at Frankfurt Motor Show". media.ford.com. Archived from the original on 2008-03-07. Retrieved 2008-02-13. ^ "Volvo promises diesel-electric plug-in hybrid by 2012". Motor Authority. 1 June 2009. Archived from the original on 2009-06-25. Retrieved 2009-06-04. ^ a b Scott Doggett (2009-06-01). "Volvo Unveils Plug-in Diesel-Electric Hybrid Car, Says It Will Be Available in 2012". Edmunds.com. Archived from the original on 2009-06-07. Retrieved 2009-06-04. ^ a b c John Voelcker (2009-06-02). "Volvo to Introduce Plug-In Diesel by 2012". Fox News. Retrieved 2009-06-04. ^ a b Vattenfall (September 2010). "Business Intelligence for E-Mobility" (PDF). PluginCars.com. Retrieved 2010-09-05. ^ a b "Volvo Cars and Vattenfall to Develop New Plug-in Diesel-Electric Hybrids; Three V70 PHEV Demonstrators on the Road This Summer". Green Car Congress. 2009-06-01. Retrieved 2009-06-04. ^ "Volvo Car Corporation Confirms Introduction of PHEV Diesel in 2012; C30 BEV Production in 2011". Green Car Congress. 2010-09-30. Retrieved 2010-10-04. ^ "Volvo's electrification chief talks C30 electric leases, industry's new battery suppliers". Autoblog Green. 2010-10-04. Retrieved 2010-10-05. ^ "2015 Volvo S60 / V60 / XC60 With New Drive-E Four-Cylinder Engine Volvo bets big on reinventing the Swedish meatball". Car and Driver. 2013-10-01. Retrieved 2015-12-29. ^ "Volvo Car USA Newsroom". www.media.volvocars.com. Retrieved 2016-06-16. ^ LeBeau, Phil (19 September 2017). "Volvo expanding US production plans in South Carolina". ^ "Volvo Cars selects South Carolina for its first American factory". www.media.volvocars.com. ^ "50 years since the Singh brothers' fantastic Volvo victory in the Safari Rally". Volvo Cars. Archived from the original on December 8, 2015. Retrieved December 2, 2015. ^ "SCCA Pro Racing World Challenge". World-challenge.com. 14 February 2011. Archived from the original on 2011-03-01. Retrieved 2011-04-02. ^ "Volvo to Expand Green Racer". PopSci.com.au. 2009-01-30. Retrieved 2009-01-30. ^ "Craig Lowndes, Jamie Whincup share wins in opening two V8 Supercar races in Adelaide". ABC Radio Grandstand. Australian Broadcasting Corporation. 1 March 2014. Retrieved 2015-03-01. ^ "McLaughlin wins Barry Sheene medal at V8 Gala". Speedcafe. 2014-12-08. Retrieved 2015-10-30. ^ "Shared ownership of the Volvo brand name". Volvo AB. Archived from the original on 2012-03-16. Retrieved 2012-03-17. ^ Norihiko Shirouzu (20 March 2012). "Jeremy Lin Hired to Endorse Volvo". The Wall Street Journal. Retrieved 2018-01-08. ^ "富豪汽車告大富豪" (PDF). Retrieved 2012-07-01. ^ ccue.com (2012-06-21). "見證香江舞國風雲 大富豪結業 傳奇落幕" (in Chinese). Dushi.ca. Retrieved 2012-07-01. ^ "Just a song before I go". Thestandard.com.hk. Archived from the original on 2015-01-13. Retrieved 2012-07-01. Wikimedia Commons has media related to Volvo Car Corporation.